Three Issan men were charged with assault and the British man they allegedly attacked was slapped with sexual assault charges after an altercation in Pattaya. 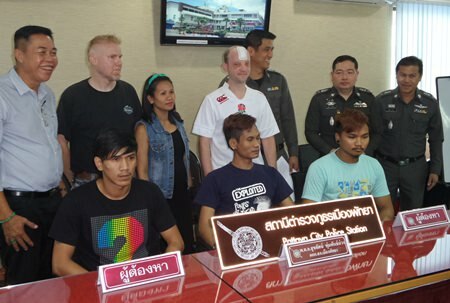 Piyarat Ketprathum, 26, Pathipan Thuekwamsue, 28, and Pathana Muensaeng, 24, were arrested April 8 after ganging up to beat up Briton Lee Huntingdon on Soi Buakaow around 3 a.m. on April 5. It seems everyone is having a good laugh at the bizarre circumstances surrounding this case of alleged sexual assault followed by physical brutality. Drunk and returning to his hotel, Huntingdon allegedly grabbed the bum of 32-year-old Kultida Thuekwamsue and tried to hug her in full view of her Finnish boyfriend at a burger stand near his hotel. Finn Mika Tapio Sauren, 44, shouted at the drunk Brit and punched him in the face. Kultida said she then called her brother, Pathipan, who brought friends to come help stomp the Englishman. Police said Pathana claimed he tried to end the argument between the two foreigners, but decided to smack Huntingdon in the face when he failed. The other Thais willingly joined him until Huntingdon escaped into a nearby Family Mart. The Thais reportedly pursued him inside to continue his beating. Police said the three men from the northeast admitted assaulting the drunk tourist because they were angry that he spoke harshly to them. Kultida, meanwhile, filed a sexual assault complaint against Huntingdon.